Having examined three thematic explanations for desistance, this chapter moves on to consider interventions by the Criminal Justice System (CJS). 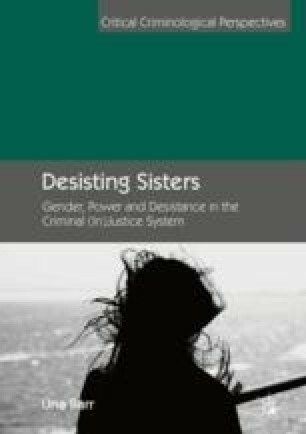 In particular, the chapter examines the criminal justice paradigm ‘Transforming Rehabilitation’ (TR) and its links to ‘Payment by Results’ (PbR), focusing on their problematic nature, particularly in the context of women’s desistance. The rhetoric of the TR agenda to include PbR is unhelpful to women attempting desistance. Desistance requires maintenance and may include deviations. When employing binary measures of reoffending, failure to comply will inevitably result in restigmatisation. Additionally PbR threatens to draw funding away from the smaller female proportion of the CJS in favour of concentration on male outcomes which are often more likely to produce positive quantitatively positive results. This chapter challenges the equating of desistance with conformity to socially constructed ideals of what it is to be a ‘pro social’ woman. Social justice in the form of community movements are considered as alternatives to the punitive CJS. This chapter links the narratives of resilience and survival presented by staff members and connects them with the desistance narratives of women attempting to travel desistance journeys. Drake, D., & Scott, D. (2017). Build Communities Not Prisons [Blog]. Centre for Crime and Justice Studies. Available at: https://www.crimeandjustice.org.uk/resources/build-communities-not-prisons-0. Accessed 27 Dec 2018. Drake, D., Havard, C., & Muncie, J. (2018). The Dubious ‘Science’ of Risk Prediction in Criminal Justice. [Blog] Centre for Crime and Justice Studies. Available at: https://www.crimeandjustice.org.uk/resources/dubious-science-risk-prediction-criminal-justice. Accessed 27 Dec 2018. GOV.UK. (2018). HM Prison Service. [online] Available at: https://www.gov.uk/government/organisations/hm-prison-service. Accessed 27 Dec 2018. The Offender Rehabilitation Act. (2014). Available at: http://www.legislation.gov.uk/ukpga/2014/11/contents/enacted. Last Accessed 12 Mar 2019. Women in Prison. (2017). Key Facts. Available at: http://www.womeninprison.org.uk/research/key-facts.php. Accessed 25 Sept 2017.